A beautiful rich red brown, the cognac classic vintage strap remains at the top of the list in terms of adding some pop to your strap game. Crafted from full grain Italian leather with a slightly waxed finish, you'll experience first hand as the strap's character develops with wear. With attention to detail, each strap is cut with precision revealing the raw edges to enhance the vintage look. 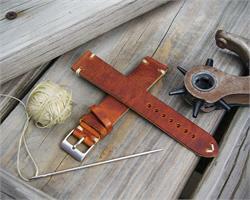 Each strap is then carefully sewn by hand with a premium waxed ecru thread. Due to the nature of this leather, each strap can have different markings making each strap unique with it's own character. It's reddish undertones can range from a darker red to a lighter red in color.